The cornerstone facilities of the Mission Operations & Data Systems division are our on-site Mission Operations and Science Operations Centers. These facilities enable our mission operators to communicate with the spacecraft through specialized satellite tracking facilities located around the world. Our two Mission Operations Centers have large banks of computers and displays for monitoring spacecraft and sending commands to them. 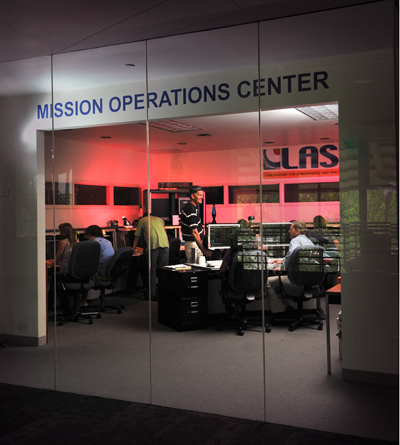 Our Science Operations Centers provide a similar function for science instruments. The instruments are monitored through these centers and commanded by our professional and student team. Our facilities house our team of professional staff and trained undergraduate and graduate students as they perform flight operations, such as converting the activity sequences provided by the Planning & Scheduling team into commands to the instrument to take data and perform other activities, or checking on the health and status of the spacecraft using operations software. Our facilities also serve to ingest data arriving from the spacecraft we operate so that we can begin processing, distributing, and archiving the data on behalf of the scientific community.